May 17, 2016 – The four planets of the Kepler-223 star system appeared to have little in common with the planets of our own solar system today. But a new study using data from NASA’s Kepler space telescope suggests a possible commonality in the distant past. The Kepler-223 planets orbit their star in the same configuration that Jupiter, Saturn, Uranus and Neptune may have had in the early history of our solar system, before migrating to their current locations. The puffy, gaseous planets orbiting Kepler-223, all of which are far more massive than Earth, orbit close to their star. “That’s why there’s a big debate about how they formed, how they got there and why don’t we have an analogous planet in our solar system,” Mills said. 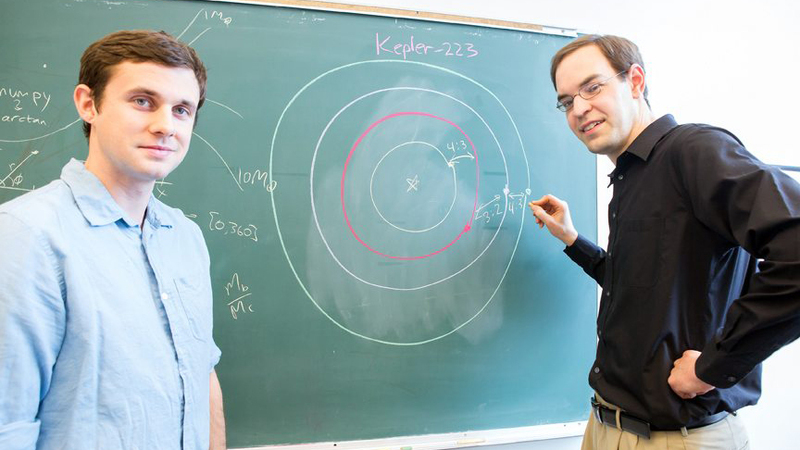 Mills and his collaborators used data from Kepler — its mission is now known as K2 — to analyze how the four planets block their stars’ light and change each other’s orbits. This information also gave researchers the planets’ sizes and masses. The team performed numerical simulations of planetary migration that generate this system’s current architecture, similar to the migration suspected for the solar system’s gas giants. These calculations are described in the May 11 Advance Online edition of Nature. The orbital configuration of our own solar system seems to have evolved since its birth 4.6 billion years ago. The four known planets of the much older Kepler-223 system, however, have maintained a single orbital configuration for far longer. Astronomers call the planets of Kepler-223 “sub-Neptunes.” They likely consist of a solid core and an envelope of gas, and they orbit their star in periods ranging from only seven to 19 days. They are the most common type of planets known in the galaxy, even though there is nothing quite like them around our Sun. Kepler-223’s planets also are in resonance, meaning their gravitational influence on each other creates a periodic relationship between their orbits. Planets are in resonance when, for example, every time one of them orbits its sun once, the next one goes around twice. Three of Jupiter’s largest moons, where the phenomenon was discovered, display resonances. Kepler-223 is the first time that four planets in an extrasolar system have been confirmed to be in resonance. “This is the most extreme example of this phenomenon,” said study co-author Daniel Fabrycky, an assistant professor of astronomy and astrophysics at the University of Chicago. The Kepler-223 system provides alternative scenarios for how planets form and migrate in a planetary system that is different from our own, said study co-author Howard Isaacson, a research astronomer at the University of California, Berkeley, and member of the California Planet Search Team. Some stages of planet formation can involve violent processes. But during other stages, planets can evolve from gaseous disks in a smooth, gentle way, which is probably what the sub-Neptune planets of Kepler-223 did, Mills said. “We think that two planets migrate through this disk, get stuck and then keep migrating together; find a third planet, get stuck, migrate together; find a fourth planet and get stuck,” Mills explained. That process differs completely from the one that scientists believe led to the formation of Mercury, Venus, Earth and Mars, which likely formed in their current orbital locations. Earth formed from Mars-sized or moon-sized bodies smacking together, Mills said, in a violent and chaotic process. When planets form this way, their final orbital periods are not near a resonance. But scientists suspect that the solar system’s larger, more distant planets of today — Jupiter, Saturn, Uranus and Neptune — moved around substantially during their formation. They may have been knocked out of resonances that once resembled those of Kepler-223, possibly after interacting with numerous asteroids and small planets (planetesimals). “These resonances are extremely fragile,” Fabrycky said. “If bodies were flying around and hitting each other, then they would have dislodged the planets from the resonance.” But Kepler-223’s planets somehow managed to dodge this scattering of cosmic bodies.